I'm not sure why TJ's decided to spell "Mexican" with a built-in homage to the cocaine cartels in Juarez. Neither Sonia (who is Mexican-American) nor I are familiar with this bizarre spelling. I guess it makes the product fancier. I'm also fond of mispronouncing "quiche" on purpose, like "kwitch-y." So, at our house, this product became "TJ's Mexi-Cocaine Kwitchy" because I'm weird like that. At any rate, we decided to sample this product and review it for you. We followed the instructions for a conventional oven. Everything came out cooked to perfection except for the egginess in the middle. It was still too wet. The outer-crust was beginning to blacken and char, and yet the middle was a little too raw—but not to the point that we couldn't eat it. The product has a fair amount of egg-omelette flavor and there's a hint of mild Mexican peppers. The crust was great. It reminded me of a homemade pie crust. But overall, this quiche is on the bland side. Have salt, pepper, and the hot sauce of your choice on stand-by when and if you decide to cook up this dish. It's in the ballpark of $3. I don't remember the exact price, I can't find our receipt, and anyway, prices may vary from region to region. It strikes me as being pretty small for a $3 quiche. A grown man could easily eat the whole thing and still be a bit hungry...and holy crap! Just as I'm writing this I glanced at the nutrition information. I don't think a full day's worth of saturated fat is something that most of us are looking for in a small treat from Trader Joe's. Originally, as I ate it, it was just yummy enough to garner 3.5 stars from me. After thinking about its economic value and its fat content, I think I'll downgrade that to an even 3 stars. Sonia gives it 3 as well, adding "That is a little bland for a Mexican dish. It should have more pepper flavor and more kick." But don't get me wrong, if you're looking for a breakfasty comfort food omelette-thing, I'd still say it's better than most greasy-spoon diner egg-based dishes. This one's definitely not a must-buy...more like a "might-try." I've eyed this several times but have always passed it by. And now I know for sure I'll skip it, "Mexican" any way you spell it should have a taste bud kick! 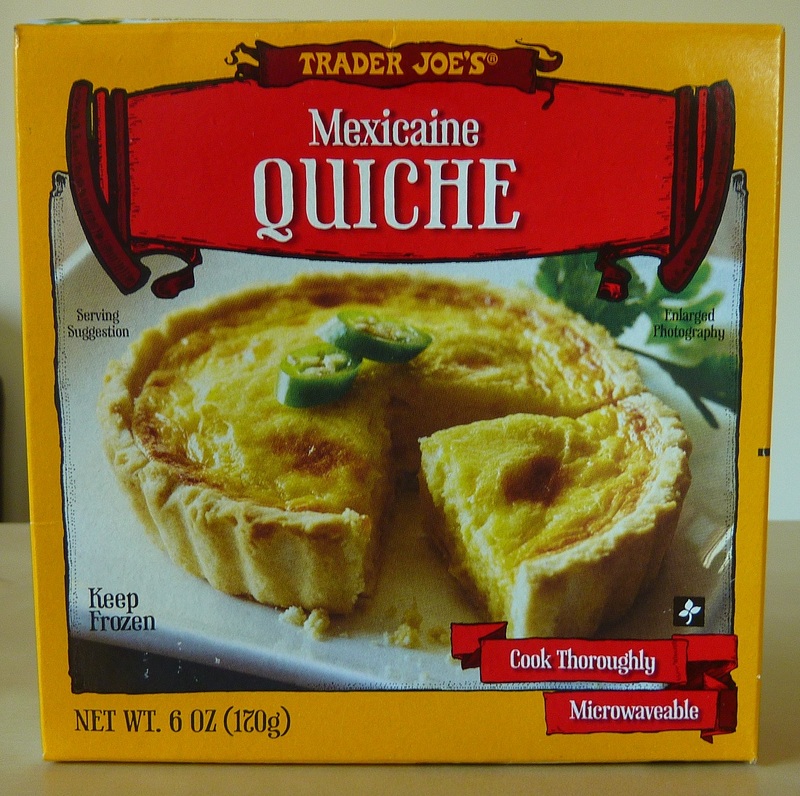 I think "Mexicaine" is how the French spell "Mexican", to go with the french quiche. Although, at first I thought it was some goofy, southern, phonetic spelling, like how Paula Deen would say "Mexican". That saturated fat content is a real drag though. 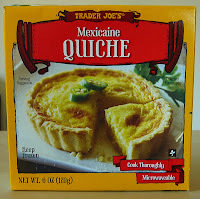 My guess on "Mexicaine" is that it is a take off on "Quiche Lorraine." Could what's left of the Truth in Advertising regulations have anything to do with this. I've noticed that products like spaghetti sauce are labeled "Italian Style" unless made in Italy. have to actually BE wings in there somewhere. Not sure, I may be totally wrong, but I do know I don't even want to guess what's in Wyngz! I love your blog and look forward to your reviews. I especially like the way you post the nutrition labels, saves me a lot of time. I appreciate your efforts, keep up the good work. Dr Oz says to maintain weight and health to never eat anything that contains over 5G of fat per serving, I sometimes cheat and have 6G - 34G never! I paid 2.29 for it in Philadelphia. I prefer the broccoli and cheese but do pick this one up every now and then and have it with a big salad. Um, it's quiche. Eggs, cheese, cream. Not a diet food. Best store bought frozen quiche i've ever eaten.